What is AQURON 300 Mix Water Conditioner Additive? An additive to the mix water, introduced to cement to make concrete. An environmentally safe, user-friendly, non-toxic, odourless, nonpetroleum,colloidal liquid. A catalyst that improves the reaction of cement with water from itsvery first introduction through to ultimate hydration. A "concrete workability & finishing" enhancer that makes pumpingand placing easier, greatly reduces the need for vibration and any tendency for a mix to segregate, producing a creamier surface fortrowelling etc, or an improved "off the form" finish. With suitable aggregate blends AQURON 300 has successfully been used to place concrete without vibration and/or as a key component of selfcompacting concrete mixes. An additive that intensifies and maximises hydration and develops significant increases in very early and ultimate strengths, including compressive and flexural strengths, surface hardness, and cracking resistance. An effective "Shrinkage Compensation" system as a result of the increase in the volume of cement hydrates and permanently incorporated water. A waterproofing system which eliminates "free" migration of water within the concrete. A protection system which works to prevent internal damage of concrete and embedded steel exposed to chlorides, industrial acids, and environmental contamination which otherwise would gradually destroy the integrity of the concrete. An economical and preferable alternative to microsilica or silica fume additives with no special requirements for storage, handling, mixing or finishing. The performance of most mix designs will be upgraded by AQURON 300 to more than what is achieved with microsilica or silica fume additives. Where it is desirable to use microsilica type materials to overcome shortcomings of available aggregates, AQURON 300 used in conjunction with microsilica reduces both the typical microcracking and the increased heat of hydration, and the concrete produced is much easier to place and finish. Outstanding results have been achieved using relatively low rate addition of microsilicas with AQURON 300 mix water conditioner, cured and sealed with Aquron 2000. How does AQURON 300 Additive improve concrete? AQURON 300 avoids "cement potency" loss when water is initially introduced. AQURON 300 eff ectively increases the product of silicate hydrates and enhances the qualities of calcium hydrates. The main binder components of the cement paste, referred to as the Tobermite Gel (CSH) is strengthened as the AQURON 300 improves calcium hydroxides which more eff ectively laminate and densify the silicate polymer strands and chains. Following the introduction of water, each cement particle tends to become encapsulated in the paste being produced. Mixing helps "shear" these hydrates away and AQURON 300 significantly helps this process by improving the exposure of the core of the cement particle to the AQURON 300 conditioned mix water. When aggregates are initially coated with cement paste immediately following the introduction of water, only the highest quality cement paste coats the aggregates. AQURON 300 significantly enhance sthe ultimate "cement paste/ aggregate" bond and this enhances the ultimate concrete strengths developed. More efficient calcium laminations induced by AQURON 300, significantly reduces the volume of unused calcium hydroxide in the "set" concrete. These alkaline hydroxides would be otherwise vulnerable to detrimental reaction with carbon dioxide dissolved in "free water" within the porosity of the concrete. This acidic attack gradually destroys the integrity of the concrete. More efficient calcium laminations effectively increase the achieved flexural and compressive strengths of the concrete. Cement particles are more eff ectively "saturated" by the AQURON 300 mix water and this subsequently increases the quantity of hydration products per cement particle. As well as helping to improve achieved strengths, AQURON 300 contributes to a signifi cant drying shrinkage compensation. With suitable mix design, shrinkage can be substantially reduced. Another benefit of improved cement utilisation is that more water is permanently chemically bound in the concrete allowing easier placing and finishing etc. The effect is that the drop in performance expected with the higher water/cement ratio does not eventuate ie. the AQURON 300 concrete utilises more water and more than equals the performance of the same mix made with the inconvenience of a much lower water/cement ratio. AQURON 300 only provides benefi ts to concrete and has no detrimental effects that often can be evident when using water reducers or super plasticisers. A major advantage of the AQURON 300 treatment is the improvement in the concrete’s watertightness, as the cement paste is densified and by comparison is much less porous than in the same mix design without the AQURON 300 treatment. An outstanding feature of the AQURON 300 treatment is that, within a concrete produced with an adequate mix design, all "free moisture" is held in the characteristic Aquron gel formation. This entirely prevents free migration of moisture, ingress of detrimental contaminations etc. A "curing and sealing" application of Aquron 2000 ensures that the concrete becomes completely impermeable. In the long term, the risk of ASR damage occurring within the concrete is entirely avoided by the influence of the AQURON 300. The direct infl uence of AQURON 300 on workability is by improving lubricity and producing distinct "gel" qualities that significantly reduce any segregation. As a result concrete density is improved. How Does AQURON 300 Improve Concrete Impermeability? Permeability is the "ease" with which liquids or gases can travel through set concrete. Permeability can be measured in a simple laboratory test by sealing the sides of a concrete specimen, subsequently applying water pressure to its top surface while measuring the volume of water flow through the specimen following flow rate stabilization. In concrete with normal weight aggregate permeability is governed by its tobermite gel porosity and the presence of larger capillary porosity, originally formed as mix water spaces. Generally permeability is a function of capillary porosity, governed by water/cement ratio and degree of hydration. AQURON 300 improves cement particle saturation and as a result increases the production of hydrates and densifies the concrete. The improved hydration continues to fill porosities that formed initially during placing and early set. The capillary porosities are typically much smaller and segmented than occurs without the assistance of AQURON 300. AQURON 300 ensures that the minimal amount of mix water, not chemically incorporated, is held in a silicate gel state and this prevents free moisture migration within the concrete. As internal moisture migration is controlled, ingress of detrimental contaminants is eliminated or at least greatly reduced. This impermeability is maximised by "curing and sealing" the concrete with an application of AQURON 2000. In existing concretes these solutions have regularly proved to have the capacity to "drive chlorides out" of exposed concretes that have become deeply contaminated. AQURON 300 "in" the mix with AQURON 2000 applied "on" the concrete, and efficiently proportioned aggregates will produce an entirely impermeable concrete. Where concrete is to be encapsulated beneath impermeable floor coverings and coatings, it is typically moisture vapour pressure that causes delamination. This problem is entirely avoided by the impermeability developed by using the AQURON 300/2000 System. How does AQURON 300 Additive discourage/eliminate Plastic Cracking, Surface Crazing & Blistering of concrete? Plastic cracks usually develop between 1 and 8 hours following concrete placement, and are in the form of shrinkage or settlement cracks. Shrinkage cracks can form, as cement paste still in a plastic state contracts, and are fairly common. Shrinkage cracks are evidenced by visible surface cracks, usually occurring as a result of surface weakness brought about by excessive surface bleed water volume. This creates a weakened layer of concrete at the surface. Shrinkage cracks also can result from too-rapid water evaporation at the surface, or water suction by dry concrete below. AQURON 300 by improving the homogeneity, cohesion of the mix and by developing "gel" qualities within the concrete, avoids segregation, and uneven settlement. Moisture, that without the AQURON 300 would be "free", in the AQURON 300 treated concrete is transformed into a "gel" state and this avoids the rapid evaporation that is typically a major factor in plastic cracking and surface crazing. With the AQURON 300 Mix water conditioner "bleed water" does not occur unless excessive water quantities are added during batching. This avoids the "diluted" concrete layer that often causes these problems in typical concrete production where some of the "water of convenience" for placing etc must escape as "bleed water". Blistering during or soon after final heavy powertrowelling of burnished floor slabs is typically avoided with the AQURON 300 treatment. This is a result of the transformation of moisture throughout the concrete which prevents moisture from the more slowly developing concrete beneath building up pressure against the compacted surface layer which has an accelerated rate of set and has been rendered almost impermeable through excessive trowelling. Additionally the AQURON 300 catalyst system improves hydration and greatly increases the healing properties of the concrete. Where heavy powertrowelling has been poorly timed and these blisters have become evident on an untreated concrete, typically these spots remain slightly drummy and very prone to delaminate. Applying AQURON 2000 as a "cure & seal" has been witnessed to both make the "blisters" disappear and heal the concrete. The use of the AQURON 300/2000 System, with its transformation of moisture within the concrete and the improved hydration production, can be seen to radically reduce the propensity for "plastic shrinkage cracking", surface crazing and blistering and the inevitable delamination that eventuates when these problems are not controlled. How does AQURON 300 Additive eliminate or reduce slab curl? Slab curl occurs around the slabs perimeter or joints, usually with the corners curling most. Generally because concrete near the top and edges dry first with corners drying fastest, or concrete near the top cools while the mass below remains warm, drying shrinkage rates vary resulting in "slabcurl". AQURON 300 improves the homogeneity of the concrete and reduces shrinkage, off -setting the conditions within the concrete that would make it prone to slabcurl. Moisture levels are consistently controlled throughout the concrete and this avoids extremities drying out more quickly and warping. Hydration temperatures are typically lowered, which reduces variations in shrinkage rates within the concrete. Using a vapour barrier membrane (DPC) beneath the concrete tends to grossly aggravate slabcurl forces in an untreated concrete, as the bottom of the slab "drowns" and the top dries more quickly. With AQURON 300 treatment this is avoided as moisture control within the concrete prevents this moisture imbalance. Additionally because moisture migration within the concrete is controlled, it is not necessary to install a membrane beneath the concrete to prevent moisture emissions rising through the concrete. Where the subbase allows the DPC to be eliminated then the slab curl forces can be largely avoided. The AQURON 300/2000 System has proved to be very successful without a DPC on a well compacted sand blinded subbase. How does AQURON 300 Additive work to prevent dusting? The surface was exposed to moisture precipitation (rain damage etc) before setting. The plastic and setting concrete was exposed to elevated levels of carbon dioxide. Allows higher water/cement ratio, high slump concretes to be poured without bleed water emissions and therefore less risk of poorly timed trowel finishing etc. The transformation and control of moisture within the poured concrete greatly reduces the risks of the concrete drying out without curing. The AQURON 300 treatment encourages improved surface hardness and resistance to dusting or carbonation attack. A feature of the AQURON 300 treatment is the fast early strength gain and this reduces the risk of precipitation damage and consequent tendency to dust. Treating the AQURON 300 concrete with an application of AQURON 2000 will further enhance the cured concrete and its resistance to dusting. Concrete damaged by precipitation such as heavy rain showers before the concrete has set and which results in serious dusting as the wearing concrete surface continues to disintegrate, have often been successfully treated with AQURON 2000. The surface is profoundly improved and hardened. Although "loose dust" must be cleaned away the otherwise ongoing surface breakdown and dusting is entirely arrested. What is the recommended dosage for AQURON 300 Additive? Added to at least 80% of the mixwater required for a batch and in the mixer bowl alone, and before cement and aggregates are added. Where smaller manual loaded mixers are used, then dosing the water in a container from which water is measured into the mix is generally the simplest. The recommended dosage rate is 250ml of AQURON 300 per 20 litres of water. For continuous mixing as used for gunite, shotcrete or flowcretes, then this rate of 250ml of AQURON 300 to 20 litres of water will be satisfactory. With very high cement proportions some increases in the rate may prove to be benefical. An essential requirement is that the AQURON 300 dose must always be mixed with at least 80% of the mixwater before the water comes in contact with any other of the mix components. What is the best technique for introducing AQURON 300 Additive into Mix Water? AQURON 300 quickly disperses and becomes diluted in water. The important factor is to ensure that at least 80% of the mixwater to be used to batch concrete has AQURON 300 mixwater conditioner added. The remainder of the water to be added, can be untreated potable water. Obviously the more water exposed to the AQURON 300, the more efficiently the influence of the AQURON 300 treatment will improve the concrete. Dosing a water "weigh tank", an otherwise empty truck mixer bowl or a venturi water flow system are all completely satisfactory mixing methods. What is the best water/cement ratio? AQURON 300 mix designs typically range between 0.4 and 0.55 water/cement ratio (depending largely on cement content per m3). Reducing the water/cement ratio "too far" can also reduce the gains produced by treating the mixwater with AQURON 300. This is because more water is permanently incorporated in the concrete in the AQURON 300 treated mix. Producing a slump of 80-90mm in a well proportioned mix design usually indicates the ideal water content. It is important that the slump is actually measured and not just visually estimated, as the concrete produced with AQURON 300 treatment tends to have strong "gel like" characteristics and as the mix in the bowl looks more cohesive, often more water is added than is desirable. An additional 5 litres per m3 can be enough to double the slump of an AQURON 300 mix. Another consequence is that an 80mm slump with an AQURON 300 concrete has a workability consistent with an 110-120mm slump when the same mix is made without AQURON 300 mixwater conditioner. Does AQURON 300 Additive concrete require special mixing? Optimal mix time is a minimum of 110 revolutions of a truck mixer bowl with adequate mixing blades. Further mixing ideally to a cumulative total of 250-300 revolutions will only tend to improve the results. Where concrete may not be entirely discharged for extended periods of several hours, the concrete should be kept slowly turning and a few litres of AQURON 300 treated water may be need to be added to maintain the slump. The concretes produced with the AQURON 300 mixwater conditioner, generally perform best without water-reducers, plasticisers or air entrainment agent. "Gun applied" concrete where a "dry mix" has the mixwater introduced as the materials leave the spray gun have been very successfully produced using AQURON 300. These "dry" sprayed concretes with AQURON 300 are substantially improved by an application of AQURON 2000 Cure & Seal. Does AQURON 300 Additive have any ingredients that may harm the environment? AQURON 300 is a very environmentally friendly solution and does not have any adverse effects. Concrete produced with AQURON 300 system is environmentally desirable as the concrete no longer harbours disease etc within the porosity. Can AQURON 300 Additive be used with silica fume/microsilica? 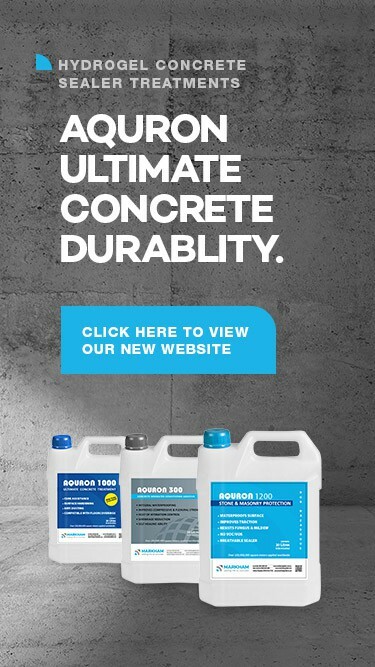 Profoundly improves the performance of concretes designed with silica fume/microsilica in the mix. Heat of hydration is lowered, cracking risks reduced and the concrete workability greatly enhanced. Often the best results will be with low rate additions of silica fume/ microsilica materials to the mix. Trial batches quickly indicate optimum rates. Using AQURON 300 in a well designed mix produces concretes with all the benefits but without the handling hassles and cracking risks that are inherent with these silica additives. Silica additives, as a result of their extremely fi ne grain sizes and pozzolanic properties help densify concrete. The colloidal silicates in AQURON 300 mix water conditioner perform the same function but from an entirely diff erent approach. The influence of the AQURON 300 catalyst induces the developments of an increased volume of hydrated components and which with the transformation of moisture results not only in an increased density but an entirely impermeable matrix. Can AQURON 300 Additive be used effectively in mixes with Fly-ash? Fly-ash is a pulverized fuel ash (PFA), and is the most widely used artificial pozzolan in the manufacturing of concrete. Flyash is generally obtained from flue gases of furnaces through electrostatic or mechanical means, particularly at coalfired power stations. Fly-ash particles are spherical in shape and are at least as fine as Portland cement particles, making flyash’s silica component readily available for reaction. As with micro-silicas, fly-ash is not generally an advantage with AQURON 300 which will typically produce an impermeable concrete with no additives other than a well proportioned blend of aggregates. The silica component of fly-ash along with its pozzolanic reactivity is much more efficiently utilised within the AQURON 300 mix water influenced hydration process. Using fly-ash with AQURON 300 Mixwater Conditioner will produce a superior concrete with an extended durability that is very inexpensively achieved by the combination of these additives. Can AQURON 300 Additive be used in mixes with Air Entrainment? Yes. Air entrainment is purposely used to provide improved resistance to freeze/thaw damage, improved durability, discourage plastic particle separation, or to improve workability. However, air entrainment over and above the actual amount needed for such improvements tends only to weaken the concrete. For example, tests have shown that air entrainment in concrete mixes, without any other mix proportion changes, decreases strength proportional to it’s air content up to a level of eight per cent (8%). Concretes made with AQURON 300 Mixwater Conditioner are not damaged by freeze/thaw conditions as the concrete is virtually impermeable to water. What would typically be "free water" without the AQURON 300 treatment is transformed into an "expanded gel" state by the AQURON 300. ie. Water held in this gel state does not expand like free-moisture when freezing occurs and as a consequence freeze/thaw damage is avoided. Can AQURON 300 Additive be used with water reduces or superplasticisers? Typically water reducers or superplasticisers do not have any advantage and may cause the concrete slump to become excessive when using AQURON 300. Most water reducers and super-plasticisers can be used with AQURON 300 but the adverse side effects of some of these materials may result in an inferior concrete. Always do a trial sample or contact the AQURON CORPORATION Representatives for more information. AQURON 300 along with all the other previously listed benefi ts also imparts the desirable "particle charge" effect in a similar fashion to some alternative additives. The homogeneity and lubricity of a well proportioned mix design with AQURON 300 typically cannot be bettered, compared to alternatives such as superplasticisers. Where the concrete produced needs improved workability, improving the aggregate sizing and blend proportions will lead to the best result. Workabilities may be adjusted if necessary by simply adding a small amount of water to the mix.